Home> Resource> iOS Transfer> How to Transfer Music from iPad to iPod or from iPod to iPad Easily? Have lots of songs on iPad and wish to transfer them to your iPod touch, nano or shuffle for enjoying them while you're on the go? Obviously, iPod is easy to carry than iPad, but you may find that you can't connect the iPad and iPod directly in the daily life, so it is seems to be impossible to copy songs between them, then what will you do? 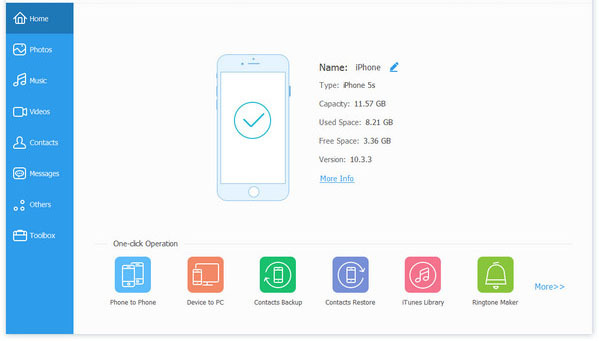 To be honest, if your iPad and iPod are sharing with a same Apple ID, then you can easily sync the iPad contents to iPod with the help of iTunes. But if you're planning to share your favorite songs with your friends's iDevice, then you have to find another way to reach the goal of transferring music from iPad to iPod to from iPod touch/nano/shuffle to iPad. So in this page, we could like to introduce two different ways to help you transfer iPad music to iPod on Windows and Mac computer. You can compare them and decide which one is better according to your own specific needs. Here, you need a tool called iOS Transfer as your personal assistant. 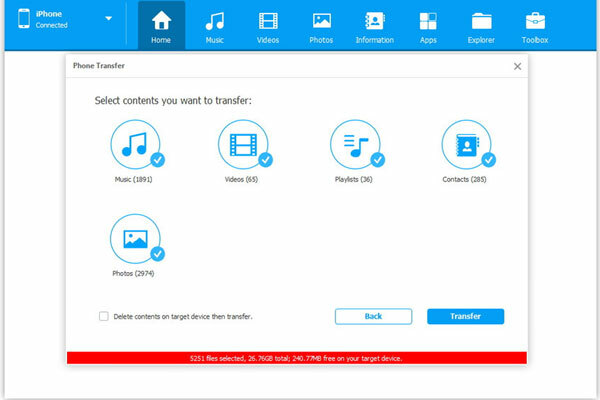 With it, you can choose to transfer music from iPad to iPod or from iPod to iPad using the file managing feature or phone to phone transfer function. The different mode will take you different using experience. For example, when you're going to copy iPad music to iPod with the managing feature, then you can also choose to export them to computer or iTunes library as you like. But if you're choose to use the Phone to Phone Transfer mode, then you can only transfer songs from one device to another. Now, just get this powerful tool and follow the below steps to see how easy the program works. How to Transfer Music/Songs from iPad to iPod or from iPod to iPad? - Link your iPad and iPod to computer at the same time. Then launch the program and ensure the connected devices have been detected by the program well. - On the iPad control panel, you can click "Music" on the top menu, and check the music files you wish to export. - Click "Export" and choose the iPod name in the drop down list, then you only need to wait for the end of the transferring. If you wish to move songs from iPod to iPad, you only need to ensure you're under the iPod control panel, then repeat the same steps as above. 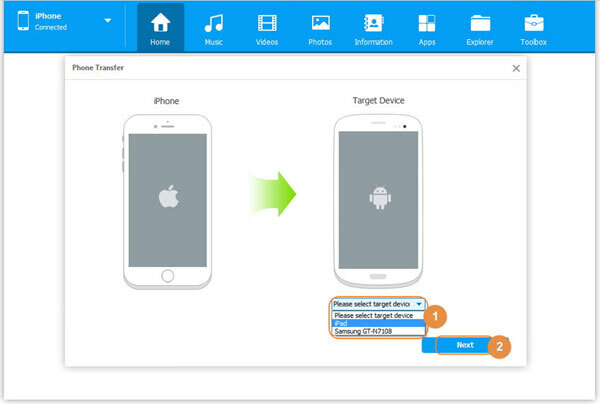 - Select your target device and click "Next" to specify the file types you wish to transfer. - Tick the "Music" option in the program and click "Transfer" button to begin the transferring process.